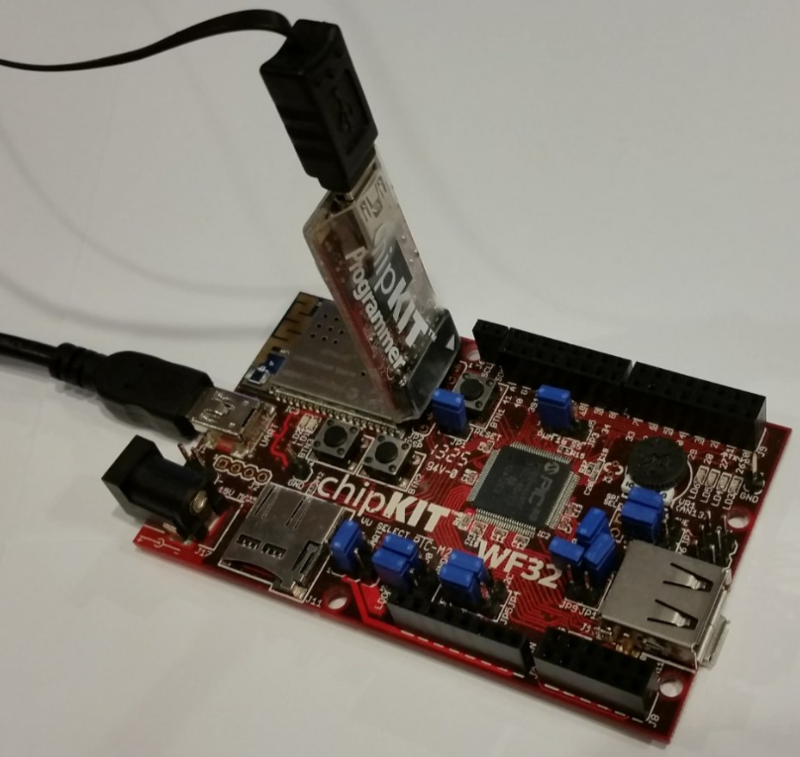 This example project uses the ADC in the PIC32 to convert an analog voltage to digital, and display the magnitude of the result on the 4 LEDs found on the Digilent chipKITTM WF32 development board. The MPLAB® Harmony ADC Driver and Peripheral Libraries are used to achieve this. 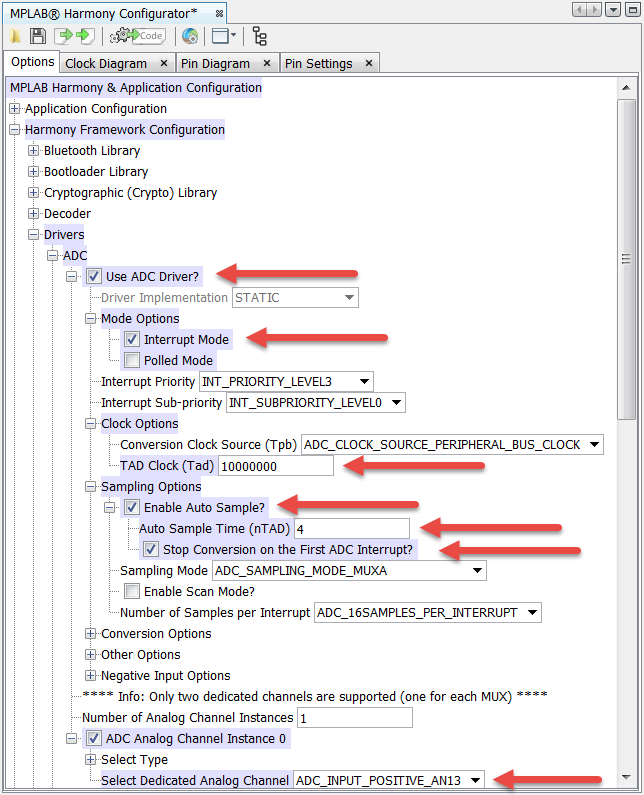 The MPLAB Harmony Configurator (MHC) is used to configure the ADC Driver to generate an interrupt after acquiring and converting 16 samples. The interrupt service routine calls a function to read and average the results from the ADC results buffer. It also sets the "dataReady" flag indicating it's time to update the LEDs with the new ADC result. The code you will add to this example project (as described in the following steps) implements the state machine shown in the diagram below. The "Project and Source Files" download (see below) contains a fully functional project. It can be used as an example and requires no modifications. To gain a deeper understanding of how to use the MPLAB Harmony framework, we recommend you generate the project and source files yourself by following the step-by-step procedure below. The contents of the following .zip file need to be placed in this directory. If this is not done, the MPLAB X IDE will not be able to find all source files, and the project will not build successfully. Use the BSP to load appropriate default values for the PIC32 core, clocks, and I/O port pins. 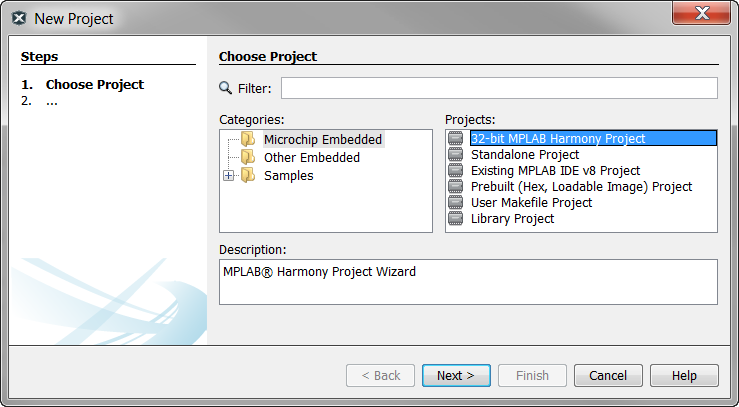 Use the MPLAB® Harmony Configurator (MHC) to select the Board Support Package (BSP) for the chipKIT WF32 board. Choosing this BSP allows MHC to load appropriate default values for this board. These default values configure the PIC32 core, clocks, and I/O port pins for you. 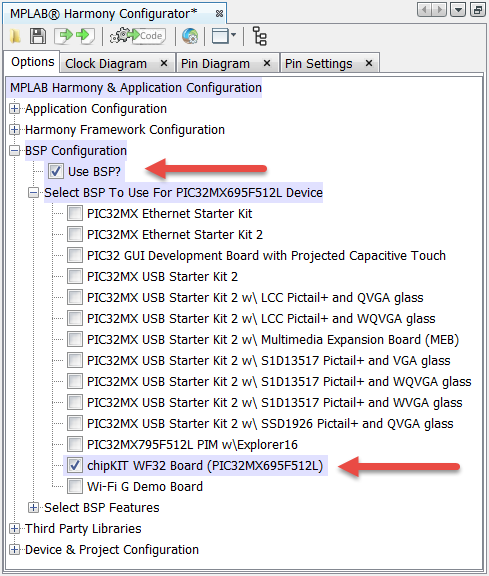 Expand the BSP Configuration sub-menu and check the box beside "Use BSP?" Expand the "Select BSP To Use For PIC32MX695F512L Device" and check the box beside "chipKIT WF32 Board (PIC32MX695F512L)". Feel free to click on the "Clock Diagram", "Pin Diagram" and "Pin Settings" tabs to see this BSP's default values. 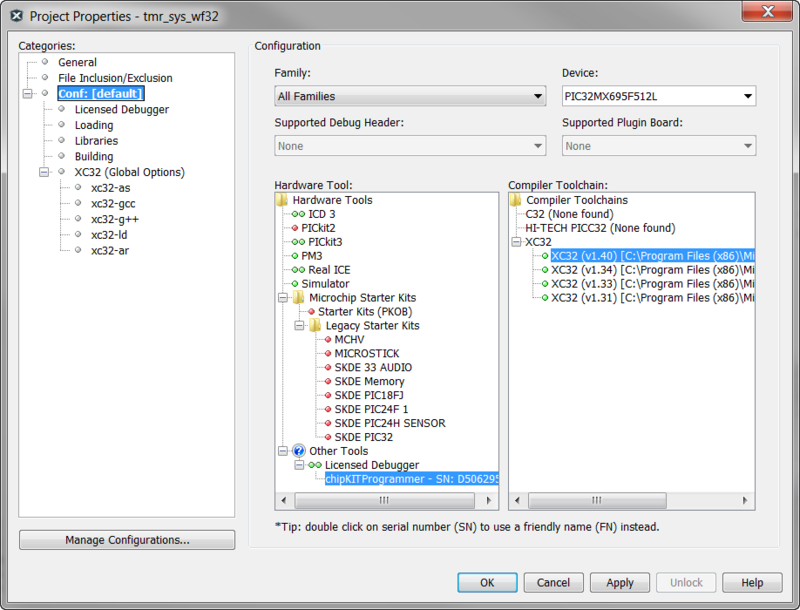 The default BSP selections for the PIC32 core configuration registers can be found by expanding the "Device & Project Configuration" and "PIC32MX695F512L Device Configuration" sub-menus. You can modify the default BSP settings if you choose. Modifications to the BSP default values will show as highlighted selections. Check the box beside "Use ADC Driver?" Expand the "Mode Options" sub-menu and check the "Interrupt Mode" box. Expand the "Clock Options" sub menu and change the "TAD Clock (Tad)" to 10,000,000. TAD is the ADC clock period. 10,000,000 Hz clock = 100 ns period. The PIC32MX695 data sheet defines the minimum ADC clock period as 65 ns. Expand the "Sampling Options" sub-menu and check the "Enable Auto Sample?" box. This causes the ADC to automatically start sampling the next analog value immediately after converting the previous value. Change the "Auto Sample Time (nTAD)" to 4. The number 4 indicates the number of TAD (ADC clock) periods required to accurately sample the analog voltage (assuming a minimum TAD period). This setting controls the "SAMC<4:0>" bits in the associated ADC configuration register. Check the "Stop Conversion on the First ADC Interrupt?" box. This disables auto-sampling when the interrupt condition occurs (e.g. after obtaining the 16th result). If this box is checked, auto-sampling needs to be re-enabled every ADC interrupt. According to the PIC32MX695 data sheet, the minimum sampling time (TSAMP) is 1 TAD period and must be at least 132 ns. The source impedance of the analog circuit connected to the analog pin should be less than 500 ohms. Higher source impedance will require a longer sample time. Please see the device data sheet and Family Reference Manual (section 17) for more details. Expand the "ADC Analog Channel Instance 0" sub-menu and change the "Select Dedicated Analog Channel" selection to ADC_INPUT_POSITIVE_AN13. This selects pin AN13 as the input to the shared ADC on the PIC32. 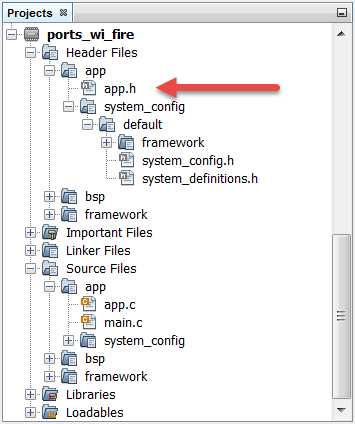 Open the app.h file, and add the application state names to the enumeration shown below (near line #87). Also comment out the existing APP_STATE_SERVICE_TASKS enumeration. You will not be using this name. You could have defined this in the application header file (app.h), but defining it in the system configuration header file (system_config.h) allows this macro to change if you plan on using different hardware platforms. MPLAB X IDE allows one project to support multiple hardware platforms through the ability to include or exclude source files from the project based on the project configuration. 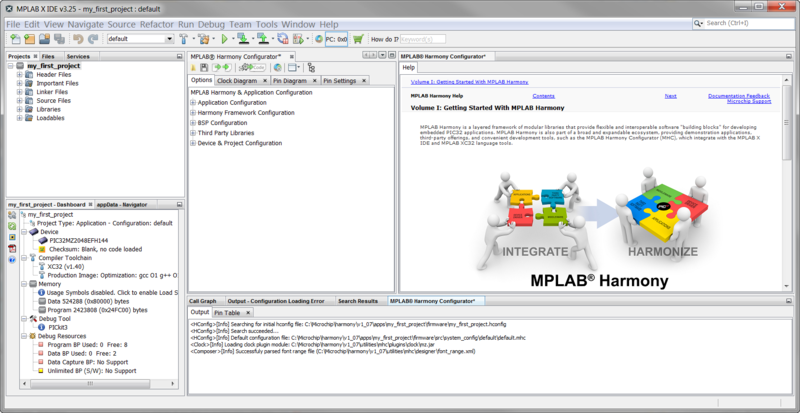 The MPLAB Harmony Framework uses this ability to include all source files in one system_config folder while excluding all others (if others exist). Add code to the ADC Interrupt Service Routine. Open the system_interrupt.c file (found in the Source Files ▶ app ▶ system_config ▶ default folder), and add the following code (near line #72). Create the callback function called by the ADC Interrupt Service Routine. Create the function to display the ADC average on the LEDs. Create the application initialization function. Create the APP_Tasks() function to implement the application's state machine. The image at the top of this page shows the state machine you are about to add to the project. The APP_Tasks() function implements this state machine. In the app.c file, add the following code to the application state machine in APP_Tasks (near line #224). Remember to comment out references to the existing APP_STATE_SERVICE_TASKS state as shown below. MHC has generated this example state for you, but you won't use it. After successfully programming the device, at least one LED will turn on. Turning the POT all the way to the left will light a single LED. As you turn the POT to the right, more LEDs will turn on (similar to a volume indicator). 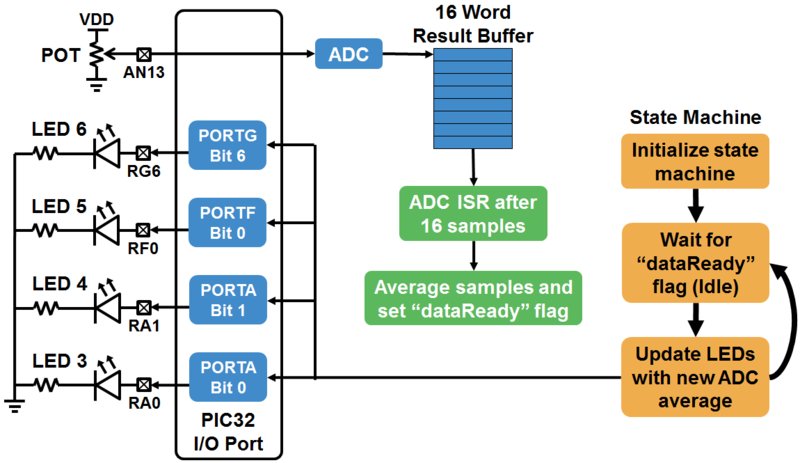 This example project demonstrates much more than configuring, monitoring, and controlling PIC32 ADC. You've also learned the basic program architecture common to all MPLAB Harmony projects.